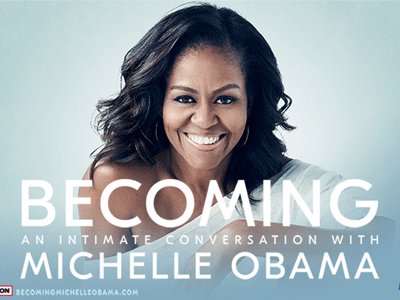 Books Inc. will be selling copies of Becoming, the memoir by the former First Lady of the United States, at her December 14 event with Michelle Norris at SAP Center at San Jose. Michelle Obama’s live U.S. book tour events in support of her highly anticipated memoir, BECOMING will come to SAP Center at San Jose on December 14, and will feature intimate and honest conversations between Mrs. Obama and a selection of to-be-announced moderators, reflective of the extraordinary stories shared in the wide-ranging chapters of her deeply personal book. Michele Norris will moderate the upcoming San Jose stop on Friday, December 14th at SAP Center at San Jose. Michele Norris is one of the most trusted voices in American journalism. She is the former host of NPR's All Things Considered and Founding Director of The Peabody Award-winning Race Card Project. Norris is the author of The Grace of Silence and has worked for ABC News, The Washington Post, The Chicago Tribune and The Los Angeles Times. She is The Executive Director of The Bridge, the Aspen Institute's program that uses narrative exchange to create connections among people of different backgrounds and perspectives. Event is scheduled to begin at 8:00 p.m.